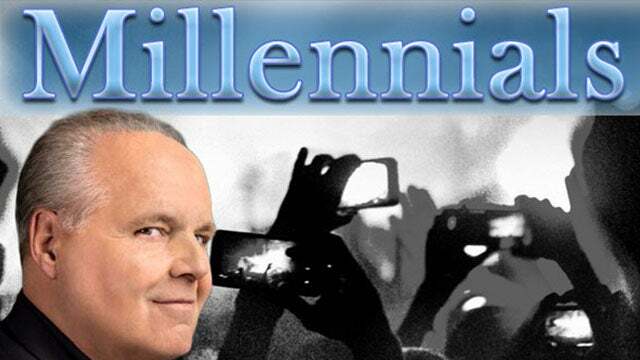 RUSH: In a related story, “Democrats Losing Support of Millennials,” this according to a new Reuters poll. Reuters is panicked over this. “Democrats are losing support among the millennial bloc of voters. The survey found that 46 percent of respondents said they would vote for the Democratic candidate over the Republican in their congressional district. That number is down 9 points from 55 percent who said they would back a Democrat.” Now it’s 46%. “Reuters noted that support for Democrats is particularly fading among white voters in the 18-34 age bracket. While 47 percent of white millennials said they would vote for the Democratic candidate in 2016, only 39 percent said they would back the Democrat this year.” What does that do to the blue wave? ‘Cause the Millennials are supposedly gonna be leading the blue wave here. Young people fed up with Trump, fed up with Trumpism, fed up with rampant masculinity as personified by Trump. This poll was of 16,000 Millennial voters. It was conducted online from January to March of this year. So enthusiasm for the Democrat Party is waning among Millennials. I wonder why that would be? Why would this be happening? Is it that tax cuts are working? Is it reality of some kind, that perception of reality is setting in? Has the boost in disposable income affected the thinking of indoctrinated Millennials? Are they exhausted after two years of hysteria brought to them by late-night comedians and social media? Could it be that two years or a year and a half of threats and panic over what’s gonna happen because of Trump isn’t happening? I don’t know. I’m asking the questions open-endedly. I can take a stab at why it’s changing. But that’s for later. The fact that it is is noteworthy. Another companion story. “A Rebirth Of Self-Reliance? Food Stamp, Welfare, Medicaid, Disability Rolls All Dropping Under Trump — The Department of Agriculture, which runs the food stamp program –” By the way, the food stamp program’s real name is the Supplemental Nutrition Assistance Program. And the ag department is reporting that enrollment in January was 40.7 million. That’s the lowest it’s been in nine years. “In the months since President Trump has been in office, the number of people collecting food stamps plunged by nearly 2 million. The same is true for welfare. Enrollment in the Temporary Assistance for Needy Families program dropped 12% last year, to reach 2.3 million. Better still, the number of workers on Social Security Disability Insurance was down to 8.6 million in March — a decline of more than 100,000,” in about 15 months. And even enrollment in Medicaid and the Children’s Health Insurance Program dropped by almost a million in 2017. These are stunning numbers. We haven’t seen numbers like this across the board like this in I don’t know how long. I mean, you just have to add this to all of the other remarkable things that are changing for the better in this country, many of them economics related, some of them cultural. There has to be a reason for it. None of this stuff was going in this direction when Obama was in the White House or even Bush before him.